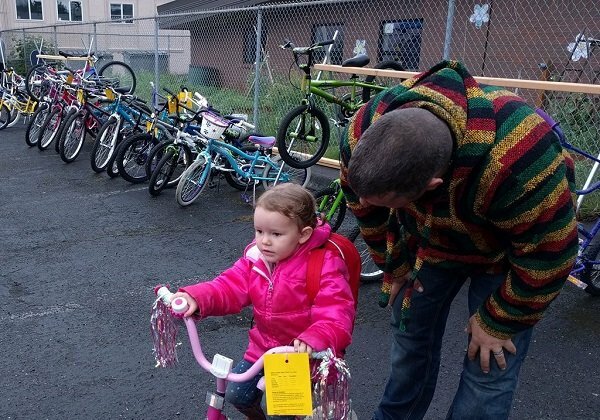 It takes lots of love – and volunteers – to keep kids bikes rolling in our community. No experience is needed, just a willingness to get greasy. Practice your mechanic skills or simply clean and primp kids bikes for our 17th Annual Kids Bike Swap. Bring some family or friends along to make it even more fun. All work parties are at the shop. Door and parking are in the back of the Broadway Mall building. Help at 3 work parties, earn $20 in shop credit. See our other Volunteer Benefits. Volunteers sign-in at our computer kiosk to track hours. Kids old enough to help are welcome if they are supervised by a responsible adult. Follow us on Facebook to see the latest.